After signing up for GrooveJar you have a free trial. Your free trial won't start until you've installed the GrooveJar code on your backend. When first logging into your account, you'll see a red button stating, "Click Here to Install". Click on the button. 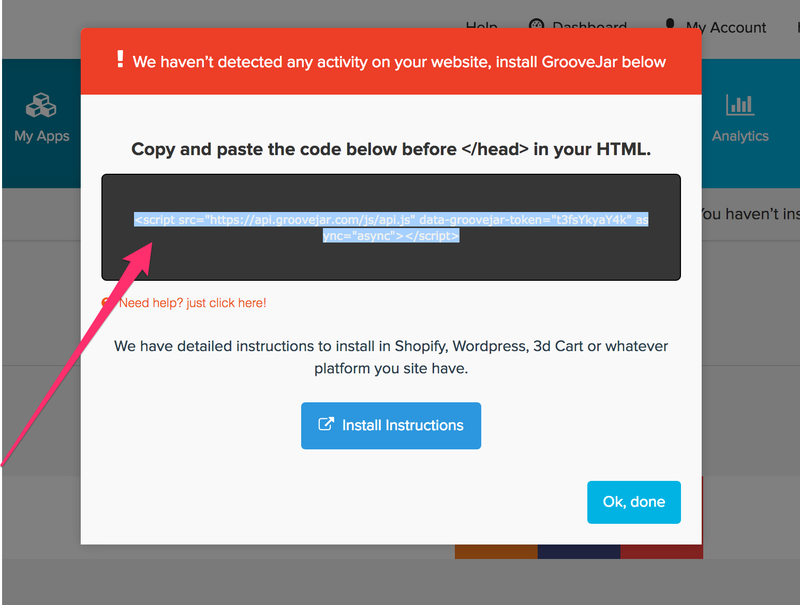 You will then receive the following popup with the code snippet. Copy the HTML. 2. Find the word "</head>" in your HTML and then paste your code snippet above the "</head>" tag. 3. Click the "Update File" button and you're finished with the install! 4. Lastly, login to your GrooveJar account and access your GrooveJar Dashboard. You should see a green button indicating the script was installed successfully! Need a hand? Don't hesitate to ask!